"I provide training to dog owners and families with a focus on proven, scientifically grounded methods, positive reinforcement and fun! I've logged thousands of hours with dogs of all breeds and temperaments including rescues, companion dogs, service dogs, therapy dogs, emotional support dogs and show dogs. I love solving problems and helping my clients find effective training exercises and behavior modification techniques. I'm certified by the Certification Council for Professional Dog Trainers and an AKC-approved Instructor and Evaluator. I do not believe in one-size-fits-all solutions or harsh, cruel, ineffective methods. I strive to stay up to date on best practices and advances in the field of training, behavior and canine cognitive science. I'm an active member of the Association of Professional Dog Trainers, a volunteer for A Fair Shake for Youth and I love dogs!" You'll find out more about the puppy and dog training services I provide here. To schedule a training or find out more, please contact me. I'd love to hear from you! 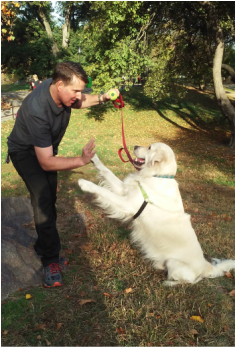 "Drew is a world apart from the alpha-dog school of training - instead he uses the best parts of a dog's personality (enthusiasm, desire to please) to create great results. He does this with positivity, consistency and keen observation. Our biggest regret during a recent move was depriving our dog - and family - of Drew!" "I've seen Drew work miracles with dogs that were on the brink of being given up. He's caring, sensitive and really tunes in for solutions. He's not just there with you on training days. Drew will keep thinking about solutions tirelessly every day, all day until he reaches a total breakthrough."